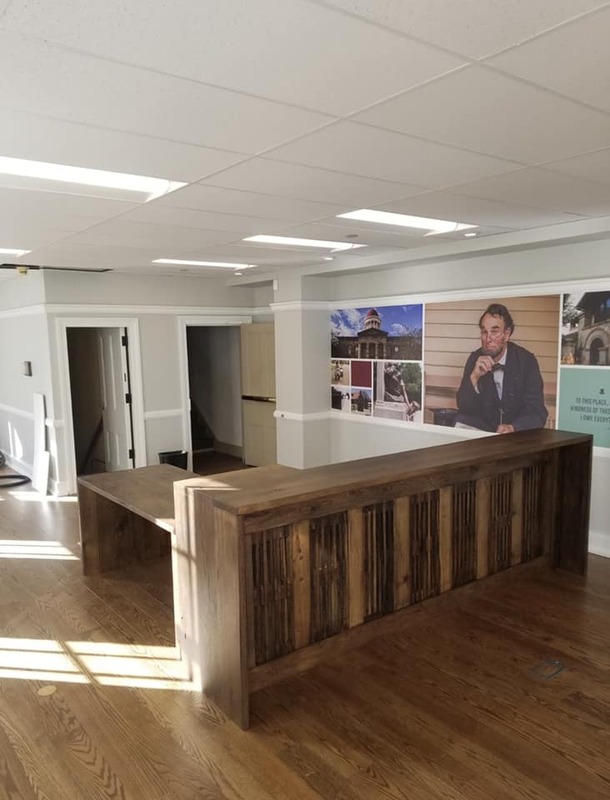 It is our mission to preserve history for future generations by creating beautifully handcrafted heirloom quality furniture, so it was an honor to design and build a piece for the new Springfield Convention and Visitors Bureau tourist welcome center housed at the Lincoln-Herndon Law Offices using reclaimed oak from the Herndon family barn. The stair treads of the Herndon barn, constructed in 1873, are a key feature in the design of the reception desk. The barn was built by Archer Herndon, whose brother William Herndon was Abraham Lincoln’s law partner. The remainder of the desk was constructed from Rock Creek barn, which was built in 1865 near New Salem. The oak that was harvested for the construction of the Rock Creek barn is native to the Sangamon River Valley. We were provided the freedom to create a reception desk of our own design our only criteria was that it fit the space on the first floor of the building, which sits on the southeast corner of the Old Capitol Plaza in downtown Springfield, Illinois. The building that houses the Lincoln-Herndon Law Offices is known by its affiliation with a dry goods store owned by Seth M. Tinsley who rented the rooms on the third floor to Abraham Lincoln and William Herndon from 1843 to 1852. Brian, Lars, Jake, Zack, TJ, and Eric all worked on it in different stages in the design and construction of the reception desk, which is not only one the heaviest pieces we have ever created at Sangamon Reclaimed but also took more than 150 man hours to complete. We are so proud to be a part of this project. We hope that visitors to Springfield and residents alike will not only enjoy the craftsmanship behind this piece of furniture but also appreciate the significant historic value it holds. We make stuff out of barn wood.